From a setup perspective, I believe what separates a good tonearm from a bad one is the adjustability of the setup parameters, and the ability of the tonearm to deliver on a precise setup so that the cartridge will be able to retrieve signals from the LP as accurately as possible. This is often easier said than done as a majority of tonearms on the market are actually incapable of delivering an accurate setup on one or more critical parameters, resulting in a less than perfect setup. Fortunately, this is not the case with the Artemis Labs TA-1. The setup process begins with installing the mounting collar onto the armboard of my Raven AC turntable. The collar is relative easy to install and requires the drilling of two holes. The first hole has to be approximately 24mm in diameter to accommodate the pivot column which extends into the armboard, or the plinth of your turntable. The second hole should be drilled exactly 23mm from the center of the first hole and should be tapped with an M6 thread in order to accommodate the screw which holds the mounting collar in place. I could have easily ordered a custom armboard predrilled for the TA-1 arm from TW Raven ($500), but because I had an old armboard kicking around, custom-made for the for the Durand Talea II tonearm, I decided to modify the aluminum armboard myself rather than spending any more money. The armboard already has a hole predrilled in the center slightly bigger than the size specified, so all I did was drill and tap a hole to install the mounting collar with the M6 screw. Because the Raven armboard can be rotated horizontally around a pivot point, the pivot to spindle distance can be adjusted later. The mounting collar was therefore installed without the use of a ruler to obtain exact measurements. If your turntable comes predrilled with a Rega style mount, you will not even need to use the provided mounting collar because the pivot column of the TA-1 arm is exactly the same size as the Rega arm. You can simply fasten the tonearm onto it by tightening the standard Rega mount. The tonearm is then inserted into the mounting collar, or the Rega mount of your table, and locked into place with the VTA set screw which also controls the height of the tonearm. 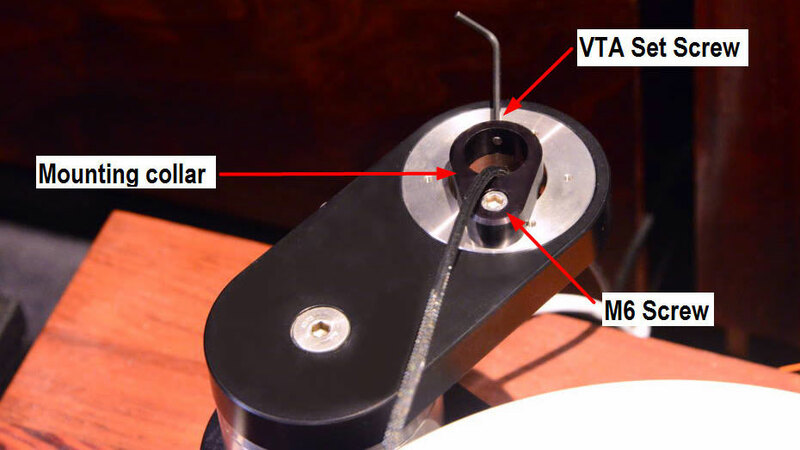 Note that the tonearm wire has to be inserted into the mounting collar because the tonearm wire for the TA-1 comes out from the bottom of the tonearm column, similar to Graham Phantom, which means buyers should be aware of the potential additional length required when determining tonearm cable length. The cable that comes with the tonearm is a continuous wire from headshell to RCA/XLR output with no breaks in between; it does not require any additional DIN to RCA phono cables. This is advantageous because experience tells me it is better to have as few connections as possible because the analog signals generated by MC cartridges are exceptionally tiny in voltage. Additional connections would only serve to degrade sound quality. The headshell of the TA-1 arm follows the same design as that of the Schroder Reference tonearm, in which the cartridge is initially mounted onto a mounting plate, which is in turn fastened onto the armwand with a M2.5 sized screw. Unlike the Schroder Reference, the TA-1 has a slot incorporated into the armwand which allows for a bit of forward and backward movement of the mounting template, making cartridge alignment easier. The cardboard mounting template which came with the arm is somewhat flimsy and does not allow you to determine the pivot-to-spindle distance accurately. You will need additional tools in order to determine the correct pivot-to-spindle distance, so potential buyers of the TA-1 tonearm are strongly advised to obtain a proper cartridge alignment tool, such as the Feickert Protractor ($250) or the highly accurate Uni-Protractor ($1,200, shepherd.a@t-online.de). Using the data on the TA-1L manual, with an effective length of 282 mm and the pivot-to-spindle distance of 267.48mm for the 12” version, I was unable to land the stylus of the Clearaudio Goldfinger cartridge onto the null points of the Baerwald geometry on any of the protractors, namely the Feickert , the Uni-Protractor as well as the provided cardboard alignment template. I repeated the exercise with a Lyra Atlas cartridge as well as a Benz Micro LP, the results were the same. The cartridge styli were 3-5mm away from the null points on all three cartridges even with the screw on the mounting plate extended to the far end of the slot. Because there is no universal standard when it comes to cartridge shape and cantilever lever length, the provided figures for effective length are therefore only an approximation. I remeasured the effective length of the tonearm (distance between the pivot to the cartridge stylus tip) and discovered it was closer to 286mm than 282mm; this latter figure yielded a pivot-to-spindle distance of approximately 272mm using Baerwald geometry calculations. I readjusted the Feickert tool to reflect this distance, and voila! The stylus was able to land on the null points on all three cartridges. I repeated the exercise with the Uni-Protractor to verify the setup and the results were again spot on. Therefore, I believe the correct pivot-to-spindle distance for 12” TA-1L version is 272mm instead of 267.48mm. Hi, a great Review from a Music Lover. I´m from Austria the land with the great “Sophien hall” for record the best records from DECCA.